Bands are dynamic creatures. They are made up of individuals who collaborate to create and deliver songs that they and their audiences love. But the band members are individuals; each one has her or his vision, artistic sensibility, and daily life. So it is not unusual for members of established bands to try solo projects or projects with other musicians to stretch themselves and to explore other aspects of their art, often improving their performance in the band and helping move it forward creatively. When members of established bands try a solo project, sometimes they opt for a private concert or a small, out of the way venue populated mostly by friends and family and dedicated fans. They are experimenting. Things may not go right; what sounded good to them in their home studio takes on a different tone in a venue. People may hate it or they may love it. That is the nature of art. Crisia Regalado, the co-founder and lead singer of one of my favorite fast-rising bands, Sin Color, decided to experiment with a solo performance that adds new dimensions to the cumbia/rock/opera-laced music that makes Sin Color so beloved in La, and I think, on the cusp of love far beyond LA. 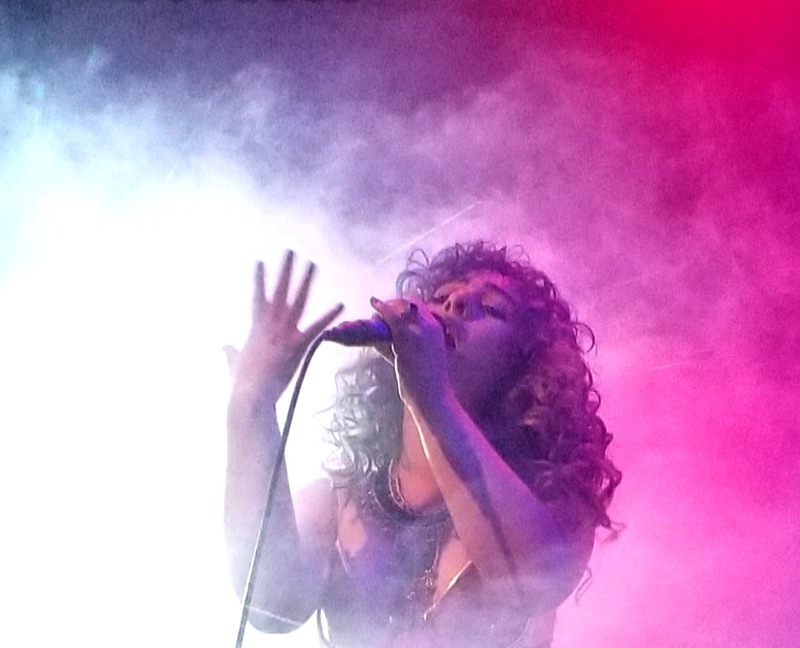 Many of the Sin Color concerts and release parties are filled with families and pre-teen and teenaged Latinas who love the band’s music, adore her as an artist and dream about emulating her when they get their turn at the microphone. All of which brings me to why I found myself Saturday night on Whittier Blvd in Montebello, home of one of LA’s famous food landmarks, the Giant Tamale. Montebello is a small city east of downtown LA with a complicated past including the decisive battle in the Mexican-American war, turf battles among Italian farmers, and oil development dating back to 1917. I knew Whittier Ave and Montebello growing up because my high school played practice football with Montebello High School, and we all hung out after the games at the Giant Tamale and other drive-in joints on the Boulevard. I didn’t see the Giant Tamale as I drove down East Whittier Blvd. looking for the venue, the VIVE Now Foundation. VIVE Nowa volunteer organization that offers life coaching to people of all ages, especially in the Latino Community. VIVE Now had offered its meeting hall for Crisia’s solo concert, making room for a large audience, adorning the stage wall with embroidered drapes, stringing sparkling lights, and bringing in sound equipment and a piano. While the venue was one of the more unusual I have been to, the effect was magic and fit the performance perfectly. Crisia’s solo experiment was not so much with new dimensions to her ongoing performing as with aspects that have been there all along: opera, jazz, and Mexican folk and romantic ballads. The music of Sin Color is built around her skill as a vocalist with a soprano range, impressive chops on the keyboard, and good solid rock and cumbia sense. Of all of the up and coming Latino-fusion bands in LA, Sin Color is a standout because of the strong collaboration between her soprano power and the band’s precision and danceable rhythms. For the solo concert, she delivered each aspect of her vocal array separately – opera, jazz, folk. The concert started with opera. Standing before us in a simple black sheath with gold accents, Crisia flawlessly delivered three opera pieces and one light opera tune, all done beautifully in classic style. Because Mexican music has a strain of romantic ballads (boleros) based on soaring opera-like notes, it resonates with the Latino community. Audiences – and myself – appreciate the beauty of her pure sound, the depth of emotion she can stir, and the discipline of her vocal control. She held the audience –including the children – spellbound. She lifted the spell as she moved into American standards. The high range of her voice did not map comfortably to songs like the 1936 stage tune “It’s Delovely” and Patsy Cline’s 1961 “Crazy”. Crisia’s delivery was professional, but never quite achieved the bell-like notes and warmth of her opera or her popular music. She performed the songs, rather than inhabited them the way she does with opera and with Sin Color. Although the solo renditions were enjoyable, I would love to hear her incorporate these standards into the band’s repertory so she can deliver them with full orchestration and really let loose. A 20 min intermission gave Crisia time to change costume and the audience to sample the pozole and conches and cookies and cupcakes and drinks served by Foundation volunteers before we filtered back into the twinkling hall. Crisia reappeared in a traditional brightly-flowered Chiapas-style Mexican dress and she really let loose. Accompanied by guitarists Chris Kehoe and Miguel Angel, she treated us to a half dozen songs of love and loss – boleros, baladas romanticas and recuerdos. Here her voice was brilliant, sailing and swooping, rolling out waves of emotion, and pulling back to twinkle with humor. All in all, I think Crisia’s experiment was as successful as any of the solo experiments I have seen over the years and I hope she continues. It gave her the space to focus on basic elements of her art and I think it will bring more creatively to the band and offers her a second outlet for her own creativity and our enjoyment. Plus it brought me back to Montebello. Unfortunately, because of the lateness of the hour, many of the families had left at the intermission. It was bedtime for the niñas who so love Crisia and the colorful dresses and powerful songs and who romanticize about their future in her. But since bands are dynamic creatures, there will be more opportunities for them to see Crisia and Sin Color and dream about singing. And it brought me back to Whittier Blvd., although I am not sure the Giant Tamale is still there.